Sport and leisure are important parts of every day's life, education, economy and globalisation processes around the World. Physical education in schools, youth sport competitions, sport for all, professional sport, Olympic games, mass tourism, leisure and entertainment represent variety of modern trends in globalise World. Sport, leisure and infrastructure as a sector of economy is a multi-billion-euros industry, which involves planning, engineering, construction, management, maintenance and usage of sport and leisure infrastructure, equipment manufacturers, events management, transport, hotel accommodation, real estate businesses, advertising and public relations, financing, insurance, tourism, health and many other sectors of economy. Sport and leisure infrastructure encompasses facilities, communal infrastructure, water and power supply systems, waste management infrastructure, transport systems, communications, security systems and other infrastructure, which supply goods and services for management and maintenance of infrastructure. Sport and leisure infrastructure includes all types of sport and leisure facilities as sport parks, recreational areas, baths and swimming pools, athletic and football stadiums, sport halls, skating rinks, tennis courts, ski resorts, golf courses, hippodromes, velodromes, shooting ranges and other facilities. The mission of the International Association of Sport and Leisure Infrastructure Management is development a network of public institutions, private companies, Universities, research institutes, educational institutions, consulting agencies, regional and local communities, which will develop new philosophy and ensure conditions for sustainable development of sport, leisure and infrastructure, develop and introduce new “social management”, educational and professional training systems, technological systems and innovative programsintroduce. The Association will open a space where knowledge and experiences of planning, building, managing and maintaining of sport and leisure infrastructure, will be exchanged between all interested parties, serving public interests, assuring sustainable development of environment and society, developing sport infrastructure and support entrepreneurship. Program of the Association will include education, consultancy, standardization, certification, communication systems and publications on the field of sport and leisure infrastructure management. The name of the organization is: "International Association of Sport and Leisure Infrastructure Management" (In further the Association). 1.2. Acronym of the Association is “IASLIM”. The Association is a non-profit international organization operating in the fields of sustainable development, social management, new technologies and innovative programs in sports, leisure and infarstructure. 3.1. Promotion of harmonized development sport, leisure and infrastructure with sustainable development of environment and society. 3.2. Representation of interests of the members of the Association. Development of certified educational and training programs for specialized professions and working places needed for management and maintenance of sport and leisure infrastructure. 3.4. Foundation of International School of Sport and Leisure Infrastructure Management. 3.5. Development of expert knowledge and executive business consultancy programs for the sport and leisure infrastructure management. 3.6. Foundation of professional Sport and Leisure Infrastructure Management Agency. 3.7. Development of standards and regulations of planning, construction, management and maintenance of the sport and leisure infrastructure. 3.8. Development of the network of sport and leisure centers on the local, regional, national and international level. Foundation of Sport and Leisure Infrastructure Management Center of Competence, which will run statistics, determine the quality criteria, issue the certificates of excellence to the sport and leisure centers in different categories and conduct the register of sport and leisure centers. Best sport and leisure centers will be awarded and promoted. Editing of the catalogue of sport and leisure centers, which will present sport centers all over the World, with their facilities, technologies, programmes, services and contacts. World directory of sport and leisure centers will be prepared. Editorial board will be set up. 3.11. Establishment of international company, which will provide funding and support management of the program of the Association. The venue of the Association is at the office address of the Association as decided by the executive board. Executive board, subject to ratification by the next general assembly, may first approve membership in the Association. Approval and ratification of membership takes place at the beginning of the general assembly. Immediately upon approval of membership by the general assembly, the new member will have full voting rights. 5.2. Membership is open to all public institutions, private companies, research institutes, educational institutions, consultancy agencies, regional and local communities, which plan, build, manage and maintain sport and leisure infrastructure or exercise educational and consultancy programs. 5.3. The Association has also individual members, who are distinguished managers and scientists of sport and leisure infrastructure management community, officials of international sport federations, top-level athletes and other internationally recognized professionals, who contributed to the development of sport and leisure infrastructure. Organizations which prefer associate membership to full membership. 5.5. Observers are organizations or individuals, who are invited by executive board, to participate the general assembly. Observers have no voting rights at the general assembly. 6.1. General Assembly is the highest authority and governing body of the Association. It is constituted by regional and continental conferences. Regional conference has three (3) votes. Continental conference has five (5) votes. Voting rights are with presidents or empovered persons of the regional and continental conferences. Affiliated member can vote through their delegates or representatives in the regional or continental conferences, which members they are. Each member of the Association can accredit up to five delegates at general assembly, all of whom having speaking rights. 6.2. General Assembly shall convene at least every two years. Two months notice shall be given of the date and venue of the General Assembly. 6.3. Quorum for the General Assembly is presence of the members, who has more than half of all votes. 6.4. Observers or associate members may attend general assembly for observations only. Observers or associate members may only address general assembly at the discretion of the meeting. other businesses on the agenda. educational institutions, agencies and other organizations established by the Association. 6.7. General Assembly ratifies executive board members, who are elected by members of Regional or Continental Conferences. General Assembly elects the President and Vice-Presidents among ratified executive board members. Nominations for the positions are valid only, if the Secretary General has received them at least two months before the General Assembly. Secretary General must forward these nominations to all members of the Association at least one month before the General Assembly. All elections are organized by secret ballot. If more than two candidates are nominated for the post of the President or Vice-President and no candidate receives a simple majority (more than 50 % of the vote cast) on the first count, the candidate with the least number of votes will be withdrawn from the ballot paper and succeeding votes will be taken until one candidate reaches a simple majority. If there is only one candidate nominated for a post, a vote shall be taken “for” or “against”. In the event of no valid nominations having been received or no nominee being elected, nominations from the floor will be accepted. Mandate of the President, Vice-Presidents and Executive Board members is four (4) years. Substitutions of Executive Board members if required will be by co-option. Executive Board will execute co-option with the person with the next highest vote at the last elections for the position in question. On recommendation of Executive Board, General Assembly can appoints an auditor. 6.10. Members of the Executive Board have speaking rights at the General Assembly. They do not have voting rights, unless they are delegates of their organizations at General Assembly. 7.1. The President call an Extraordinary General Assembly, if one third of the members or a majority of the Executive Board members make a written request to that effect. 8.1. The President has the authority to speak on behalf of the Association, in as much as he/she is answerable to the executive board and the general assembly. 8.2. The President presides Executive Board meetings and General Assembly. 8.3. The President has overall responsibility for the general running of the Association. 8.4. In case of parity of votes at either Executive Board meeting or General Assembly, the President has the casting vote. The longest serving Vice-President within his or her election period shall deputize the president in his absence and carry out all functions normally undertaken by the President. 9.1. Executive Board governs and manages the association in between General Assemblies. It is responsible to the General Assembly. appointment of the Secretary General. 9.3. Executive Board is composed of members of the Regional and Continental Committees that are ratified by General Assembly. Regional Committees can have up to 7 members and Continental Committees up to 9 members in the Executive Board. 9.4. Executive Board meets at least once a year, with a minimum of two months notice. 9.5. Quorum for Executive Board meeting is presence of more than half of the members. 9.6. Each member of the Executive Board must be a member of an affiliated organization of the Association. 9.7. Executive Board can appoint honorary members. Honorary member will be invited to participate Executive Board meetings, without voting right. 10.1. Executive Board appoints a Secretary General who, with reference to the President, is responsible for implementation of the program of the Association, financial affairs and co-ordination between General Assembly, Executive Board, Commissions, Regional and Continental Conferences and Committees. 10.2. The Secretary General is responsible for materials and proposals for the meetings of the Executive Board and General Assembly. He attends the meetings, without voting rights. 10.3. The Secretary General receives fee or salary, which is decided by the Executive Board. 11.1. The Executive Board may establish Commissions to assist it in the work of the Association. 11.2. Commissions cover different scopes of activity, such as Statutes, Finances, Public Relations, Marketing, Development, etc. The Executive Board appoints Chairmen and members of Commissions. Each member has one vote. Commissions shall meet at least once a year, with a minimum of two months notice. 11.3. Quorum for the Commission’s meeting is presence more than half of the members. Any member of the Commission must be a member of an affiliated organization of the Association. 12.1. The Executive Board may establish Regional or Continental Conferences to assist it in the work of the Association. 12.2. Regional Conferences encompass, organize and represent members of the Association from geographically, politically and economically rounded up areas. 12.3. Continental Conferences encompasses, organize and represent members of the Association from one defined continent. 12.5. 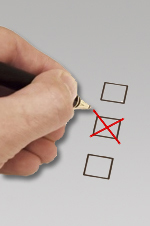 Each member of Regional or Continental Conferences has one vote. Quorum for the Regional or Continental Conference’s meeting is presence more than half of the members. The Conferences meet at least once every two years, with a minimum of two months notice. 12.6. Members of the Regional or Continental Conferences elect the President and members of Regional and Continental Committees, for a four-year period. 12.8. The appointed President must communicate all decisions of the Regional or Continental Conferences and Committees to the Executive Board, for approval. All Conferences are responsible to the Executive Board. 12.9. Each member of the Regional or Continental Conferences must be a member of an affiliated organization of the Association. The Regional or Continental Conferences can appoint honorary members. The honorary members will be invited to participate in the Conferences meetings without voting right. 13.1. The Executive Board may set up Head Office to assist the work of the Association, execute the program of the Association, perform marketing activities, organize administration and co-ordinate work of the General Assembly, Executive Board, Commissions, Regional and Continental Conferences and Committees. 13.2. The Executive Board shall decide the place, organizational structure, personnel and financial sources of the Head Office. 13.3. The Executive Board appoints Director of the Head Office, who is responsible for the administration, marketing and financial operations. He employs the personnel. For his work he is responsible to the Executive Board and Secretary General. 13.4. The Director of the Head Office attends the meetings of the Executive Board, without voting rights. 13.5. The Director of the Head Office receives fee or salary, which is decided by the Executive Board. 14.1. Regional or Continental Conferences may set up Regional or Continental Offices, with approval of Executive Board. 14.2. Regional or Continental Offices assist the work of Regional or Continental Conferences, execute the program of the Committees, perform marketing activities, organize administration and co-ordinate work of the members. 14.3. Regional or Continental Conferences decide the place, organizational structure, personnel and financial sources of the Regional or Continental Offices. 14.4. Directors of the Regional or Continental Offices, who are responsible for the administration, marketing and financial operations. They employ the personnel. For their work they are responsible to the Regional or Continental Committees. 14.5. Directors of the Regional or Continental Offices attend the meetings of Regional and Continental Conferences and Committees, without voting rights. 14.6. Directors the Regional or Continental Offices receive fee or salary, which is decided by the Regional or Continental Committees. other languages at Regional and Continental Conferences (Spanish, French, Russian, Chinese, Portuguese, Arabic and others languages). 16.1. Each member Organization pays an annual membership fee, which is decided by the Executive Board. 18.1. The Executive Board may terminate the membership of any Organization, if two-thirds of the members present and voting decide that the Organization has ceased to comply with the objectives or Statute of the Association. 18.2. Excluded Organizations will have a right of appeal to the next General Assembly. 18.3. Notification of terminations and appeals must be forwarded to all members. 19.1. A Statute can only be amended, added or deleted by a General Assembly or an Extraordinary General Assembly. The proposed amendment must be submitted in writing for inclusion on the agenda of the General Assembly or an Extraordinary General Assembly. 19.3. The President must receive such proposals not less than three months before the General Assembly or an Extraordinary General Assembly. 19.4. The President must forward all proposed amendments to the members not less than two months before the General Assembly or an Extraordinary General Assembly. 19.5. A proposal to amend, add or delete a Statute can only be carried by at least 51% of the votes cast. 20.1. The dissolution of the Association can only be pro¬nounced by a General Assem¬bly, or by an Extraordinary General Assembly called for this purpose. 20.2. A two-thirds majority of the members present and voting is required for dissolution. 20.3. The Assembly decides on the appropriation of the Association's properties, which can only be assigned to International Organizations recognized as having the same aims as the Association. 21.1. The Executive Board decides on matters, which are considered relevant to the Association but not mentioned in this Statute. This statute was passed at assembly of International association of sport and leisure infrastructure management, which was held on December 4th 2008, at Bled, Slovenia. Association operates on four levels. 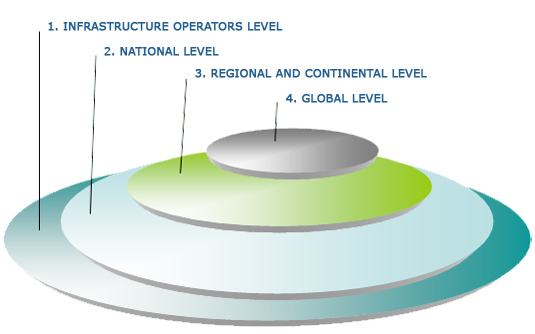 The most important is first, basic level, which encompasses infrastructure operators that manage the facilities. National associations of sport centers, managers and infrastructure operators, represent interests of their members and manage affairs with the states, regions, local communities, providers of good and services, Universities and schools. Regional and Continental Conferences coordinate activities, organize international educational programs and meetings, and support cooperation of National associations in regions and on continents. 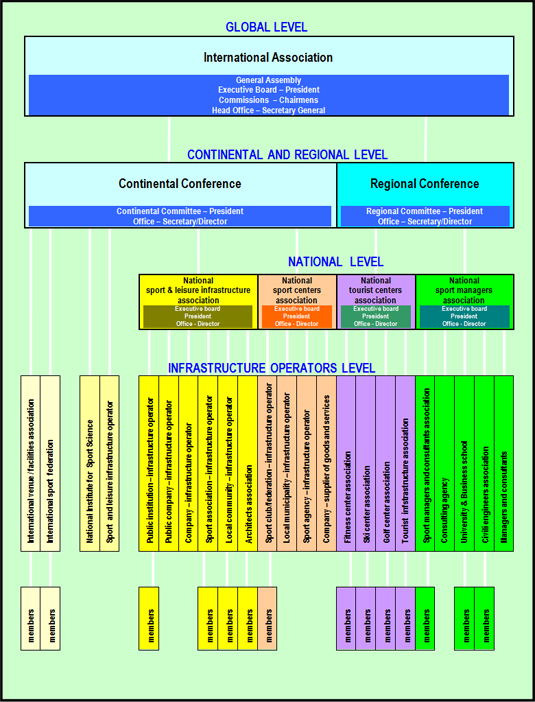 International Association coordinates activities of regional and continental conferences and other international organizations, on global level. Sport and leisure infrastructure encompasses facilities, systems, goods and services that enable the sport and leisure. Municipal infrastructure, water and energy supply systems, transport, communications, security and other systems which provide goods and services for the operations and maintenance, are parts of the infrastructure. There are several hundreds different types of sport and leisure facilities: sports centers and parks, recreational areas, baths and swimming pools, athletic and football stadiums, sports halls, skating rinks, tennis courts, ski resorts, golf courses, cycling tracks, horse racing facilities, shooting ranges and other facilities and areas. There are several millions infrastructure operators, which manage sport and leisure infrastructure, worldwide. These Associations are national networks of public institutions, companies, local communities, sport organizations, Universities, business schools and others, operating in the field of sport and leisure infrastructure. Associations establish co-operation among all these subjects, to serve public interests, support sustainable development and develop social management, infrastructure and businesses. They create space for development of new concepts of management, exchange of knowledge, experiences and best practices. They represent a frame for decision makers, who will use their guidelines for directing future social and economic development, investing money, managing infrastructure and providing sport and leisure programs and services on the local, regional and national level. International Association may establish Regional and Continental Conferences to assist it in the work of the Association. Regional Conference encompasses, organizes and represents members of the Association from geographically, politically and economically rounded up areas. Continental Conference encompasses, organizes and represents members of the Association from one defined continent. Regional/Continental Conferences elect/establish Regional/Continental Committees. Committees coordinate all activities and represent members of the Conference. They prepare programs, conduct financial operations, organize educational programs, conferences and meetings. They support foundation of National Associations. International Association encompasses National Associations, Regional and Continental Conferences, which cooperate in the fields of sustainable development, social management, new technologies and innovative programs in sport and leisure infrastructure. International Association has General Assembly, which is constituted by members and representatives of Regional and Continental Conferences. Executive Board is constituted by members of Regional and Continental Committees. The Board coordinates all activities and represents members of Association. The Board prepares program, conduct financial operations, and organize educational programs, conferences and meetings. The Board appoints Secretary General who organizes work of the board, runs financial affairs and other duties and tasks, which are assigned by the board.